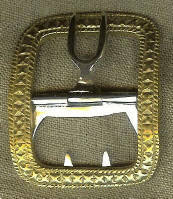 BCS127 buckles are copied from an original found in the Hudson River Valley, and are available in both brass and nickle. They will accommodate a normal man's shoe strap width of 1 3/8". The overall dimensions are 2" by 2 1/2".